I know some of these items are really tiny and should only take a few minutes, but there are so many of them that I am starting to panic just a bit. 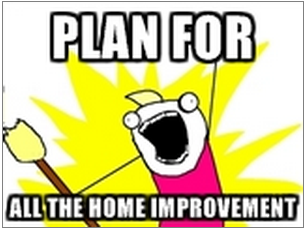 There are also large large projects to do, like painting the ugly out of the house. I know it is my house and I have as long as I wish to get these things done, but (as I have mentioned several times already in this blog) I am impatient and I want everything done NOW. I could also use a hand with things but much like my life, my friend’s lives are crazy hectic too nowadays. I need to organize and prioritize things. I am a master list writer, so I think my next entry might be just that- a master list of things that need to be done, prioritized and put into a timeline. Yes, I am that neurotic. And yes, I will probably write it all on newsprint and make a checklist for home. But I will hopefully get everything done without pulling out my hair. « $9 of burlap + $3 of lace + 45 minutes = New Curtains for my office!